Many office projects and proposals are made on Microsoft Project, but Microsoft has not developed a Project viewer, yet. 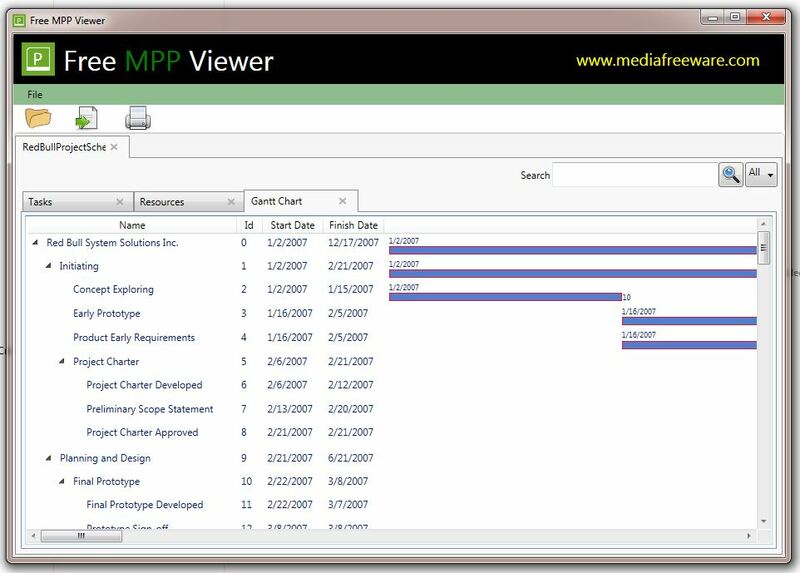 The Free Mpp Viewer is just what users need to be able to view projects made on Microsoft Project. The Free Mpp Viewer saves money for a lot of users. All that they need to do is to have this software installed on their computers. Since projects are mostly made by a specific number of people and reviewed by many, all users do not need to make changes, thus having a Free Mpp Viewer serves the purpose for most users, as they do not need to buy the Microsoft Project package. The user interface for the Free Mpp Viewer software is detailed, yet simple. Each project is categorized into Tasks, Resources and Gantt Chart. Gantt Chart is a very useful measure tool in project management. It comprises of the activities on the left hand side and time frame towards the top. There are bars that denote the amount of time taken for each activity. It also helps the user analyze if there was an overlap between the time frame of two activities. It can give the user detailed information about the time required for each and every activity listed, along with giving an idea about the start and the end date of the project itself. The Free Mpp Viewer displays the project file in an orderly fashion, with heads and sub heads for different stages of the project like Initializing, project charter, planning and designing, Final prototype and other heads, depending on the type, size and time duration of the project. The categorization and ease of working with the Free Mpp Viewer make it favorable for both intermediate and advanced users. The other commendable feature of the Free Mpp Viewer is that every screen is printable.